Compare that to where we ended up: House 34D, 66R and Senate 19D 21 R. My big miss on the House side was in District 02, where the former occupant of the seat reclaimed it. I wish I could claim that I am good at picking winners and losers but I’m not. What I’m good at is looking at history and spotting trends. Anybody with the time to actually run the numbers would have come to the same conclusions that I did. The demographics of the districts – gerrymandered as they are – win almost every time. That’s why I’m laughing at all the headlines today. To hear them tell it, this was a repudiation of the governor. No, this was just proof that gerrymandering works. When I can project five months in advance and basically ignore everything in the interim and still be mostly accurate, that tells you that this has nothing to do with the governor or the $45 million – a number I heard last night on Twitter, haven’t checked it out – that was spent. We don’t need any more proof. No doubt some will argue, “But the Democrats gerrymandered the Senate and don’t have the majority!” Both of those statements are correct. I can’t help it if Democrats were inept in redistricting the party out of a majority. The thing is: anybody watching since then already knew that’s what they had done. Hell, just look at the results from the 2011 Senate races! This is the first campaign season in a long time that failed to hold my interest. The foregone conclusions of it, combined with what has been the worst political reporting I’ve ever seen – “Incumbent Del. John Miller fended off Republican challenger Mark Matney in a race for the state Senate’s 1st District seat.” WTH? – made it painful to watch, even for this political junkie. I can only imagine how bad it was for the average voter. Oh well. There’s always local elections next May, at least in Norfolk. There are local elections on the peninsula also in Hampton. I am glad they never moved those elections at least people sort of pay attention to local politics because its not over shadowed by the larger elections. I entirely agree, Carole. Similarly, I am very glad that Virginia elections are in odd-numbered years. I would be interested to know why you think so, since turnout is usually larger for elections in even-numbered years/presidential election years. People mistakenly think those elections are most important, when in truth the most important elections that affect our lives are local. Although, as Vivian’s article points out, greater turnout may not matter when districts are so completely gerrymandered. Reduced turnout is EXACTLY why I like odd-year elections in Virginia — only those who care enough to pay attention get out to vote. 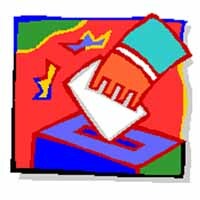 If a citizen is unwilling to familiarize themselves with the issues then the greatest service they can do is NOT vote. Elections are not picking lottery numbers. Odd year elections and city council races held in May let the media and the candidates highlight local issues which may have little in common with state and national issues. Having all elections together would mean less time for local candidates and even less media coverage then we have now for important regional issues. I like the way Norfolk does elections. The Beach made a mistake altering their system but it was done to protect incumbents. who tend to fare better hidden at the bottom of the ballot . The gerrymandering makes it seem futile to even bother voting. When a district been configured in a way designed to assure victory for a particular party, then even if there is opposition (and often there isn’t) the result is nevertheless assured, making it seem almost a waste of effort to vote. Of course the same might be said about the electoral college (if your state is going to go blue or red no matter how YOU vote and popular vote is irrelevant, then it seems almost pointless to bother). I’ll keep dutifully going to the polls and at least in local non-partisan races one can still feel that his/her vote matters, but it is a shame that the results in so many races are foreordained by the parties.